What happens when your teacher springs a last-minute talent showcase on the class and you have no idea what your talent is? Ask your cat for help, of course. Phoebe and Beeswax: There’s No Beeswax Like Show Beeswax is the latest offering from Vince Dorse and Long Lost Friend Studios. It’s a 32-page, full-color story of Phoebe, who is dreading tomorrow’s lesson plan. Her teacher has announced a talent showcase, and Phoebe’s convinced she has no talent. Luckily, she’s got her cat (and good friend), Beeswax to lean on for support. A confident feline, Beeswax is certain that if they work together, they can figure out what Phoebe’s talent is before the night is over. Phoebe and Beeswax: There’s No Beeswax Like Show Beeswax is sort of a hybrid — laid out a bit like a children’s book, some pages have very sparse (or no) background art, and feature just a single character, expressing a simple thought. While other pages are stacked with comic book panels and sequential action. The idea for the book began as an experiment with black-and-white mini-comics. A simple story in a simple format. But as it progressed, it became apparent that the characters and backgrounds would benefit greatly from a splash of color. And, so, the b/w mini-comic blossomed into a full-color, full-sized kid-lit story in comic book format. Phoebe and Beeswax is an all-ages story that mixes laughs, action, and heart to explore the concepts of talent, perseverance, and friendship. The comic debuts at Baltimore Comic Con, Sept. 22-24 at the Baltimore Convention Center. Visit Table A-233 to pick up a copy. Back in April, I mentioned here on the blog that Untold Tales of Bigfoot: Crossing Paths won a bronze medal at the 2017 Independent Publisher Book Awards. The medal recently arrived and oh boy, is it shiny! Bigfoot won the “IPPY” in the category of Graphic Novel, Humor/Cartoon. Here he is, as pleased as punch to be modeling the bauble. While waiting for the fine folks at Independent Publisher to ship the medal, I put together a 2-page comic using an awards medal as my MacGuffin. You can view that comic here. I’m happy to announce my all-ages graphic novel, Untold Tales of Bigfoot, just earned a Bronze Medal in the category of Graphic Novel, Humor/Cartoon in the 2017 Independent Publisher Book Awards. Launched in 1996, The “IPPY” Awards are open exclusively to independent authors and publishers around the world. This year’s awards, the 21st annual IPPYs, drew almost 5,000 entries from around the globe. Storybook. Art Book. Coloring Book. Light the Jack-O’-Lanterns! I’m happy to announce the printing of Wish On A Halloween Moon, a collection of daily ink drawings I stitched together into a spooky story one cold, candle-lit October. Henry’s family moves to a new town right before Halloween, and he doesn’t have time to make friends before the big night. Moping on the porch in his magician’s cape and top hat, an idea comes to him — he’ll make a magical wish on the Halloween moon! 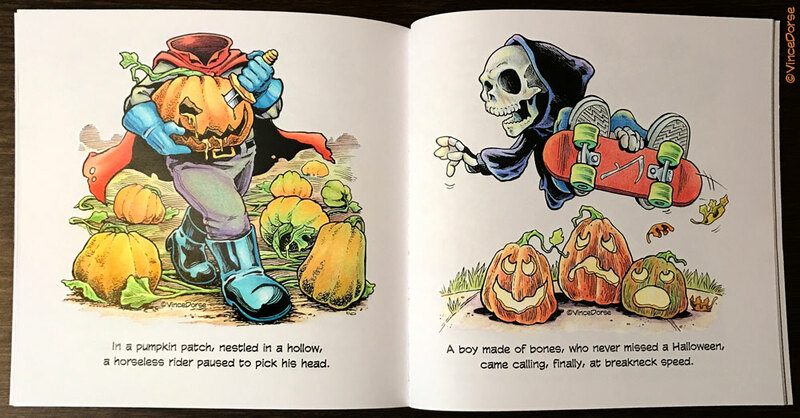 And, as it often follows with these things, Henry’s wish comes true…but it unearths some very unexpected tricks and treats (what — like I wasn’t going to make a trick-or-treat reference in this post?). As night falls, monsters of all shapes and sizes lurch, slither, and shamble out of the shadows to converge upon the unsuspecting newcomer. It’s a fun, sweet, spine-tingling tale perfect for a dark October evening. 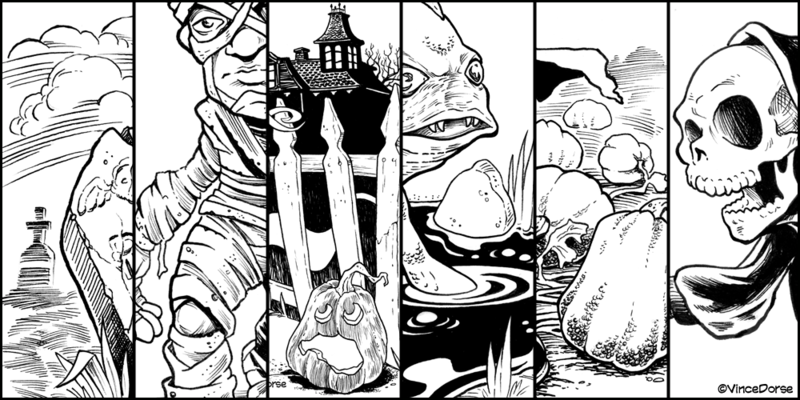 Initially, Wish On A Halloween Moon was a chance to step away from a digital workflow and get back to traditional ink-on-paper illustration. The opportunity to scratch, hatch, and stipple on real paper with actual pen-and-ink was a nice departure. And the challenge of posting one ink drawing per day online that October (along with the narrative verse) kept things moving at a brisk pace, and infused the process with a mildly chaotic energy that kept things hopping. Collecting these words and images in a printed volume is my way of documenting a challenging and enjoyable project, and a chance to share it with everyone else, whether or not they followed the original posts online. You can read the story, enjoy the collection of illustrations, or — for an even more interactive experience — dig out your colored pencils and crayons and color the book! That’s right! 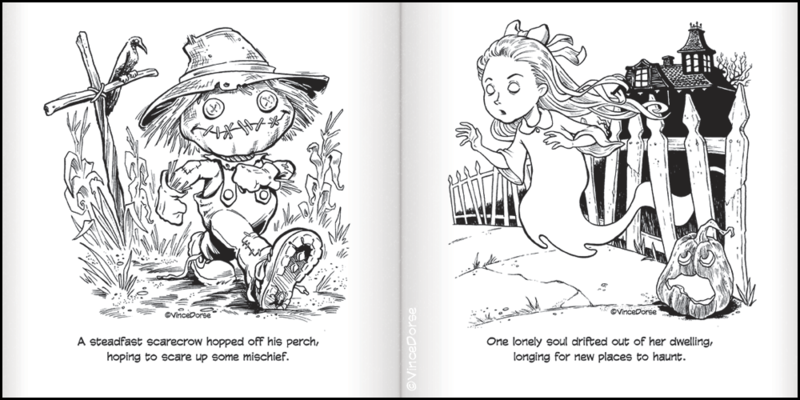 Much like pumpkins can be used for making pies or projectiles, Wish On A Halloween Moon was designed with multiple applications in mind, not the least of which is a spooky-fun coloring book for kids and grown-ups who love Halloween and monsters. 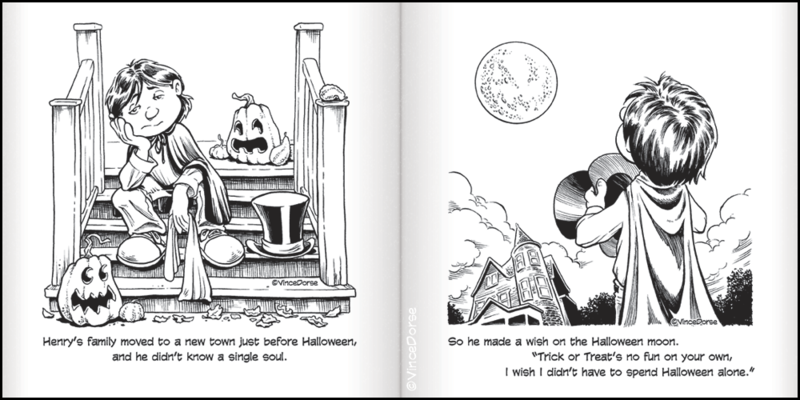 Available now in the Vince Dorse Online Store, Wish On A Halloween Moon is the second book published under my Long Lost Friend Studio imprint, contains 40 black-and-white pages, sells for a very reasonable $8.00 USD, and, as an extra treat, ships with a bookmark which can also be colored. No eggs on my door. Untold Tales Of Bigfoot Now Available In Print! I’m happy to announce the award-winning online comic, Untold Tales Of Bigfoot: Crossing Paths, has been officially released in paperback and is now available as a 140-page graphic novel! This First Edition (paperback with French-fold cover) includes a foreword by author Matthew Cody (Supers of Nobles Green Trilogy, The Peddler’s Road, Remade), and afterword by creator Vince Dorse that includes production sketches and a history of the comic. Untold Tales Of Bigfoot is an all-ages adventure about a lost dog named Scout and a lonesome Bigfoot. Copies of the book for Kickstarter backers are now being prepped for shipping, but if you missed out on the campaign you can still purchase copies of the book in the Vince Dorse Online Shop. If you enjoy the book, make sure to tell a friend (and your local library). We’d love to help Bigfoot and Scout find a large family of readers. As an added bonus, all books in this first shipment of Untold Tales Of Bigfoot will be signed by the author, with an accompanying ink sketch.